In my [previous posts] I discussed about new features of Denali, now SQL Server 2012. Here, in this post I’ll talk about a new feature that I explored recently, when I was working with creating tables in SQL Server 2012. I observed a new item in object explorer that took my attention and created eagerness to explore it, and that new thing is FileTables. As per MS BOL, The new FileTable feature brings support for the Windows file namespace and compatibility with Windows applications to the file data stored in SQL Server. FileTable lets an application integrate its storage and data management components, and provides integrated SQL Server services – including full-text search and semantic search – over unstructured data and metadata. In other words, you can store files and documents in special tables in SQL Server called FileTables, but access them from Windows applications as if they were stored in the file system, without making any changes to your client applications. The FileTable feature builds on top of SQL Server FILESTREAM technology. Here, I’ve manually created 3 files, 1 notepad, 1 powerpoint and 1 word doc. You can also copy files from other locations and paste/drop them here. 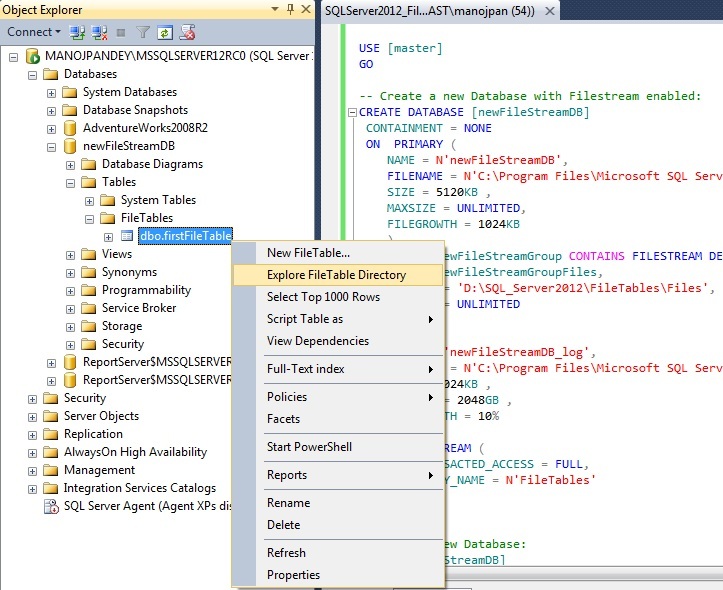 As you paste/drop files here, SQL Server internally updates the [firstFileTable] file table. I liked this new feature very much as this will ease the work and reduce the overhead of maintaining files with databases. 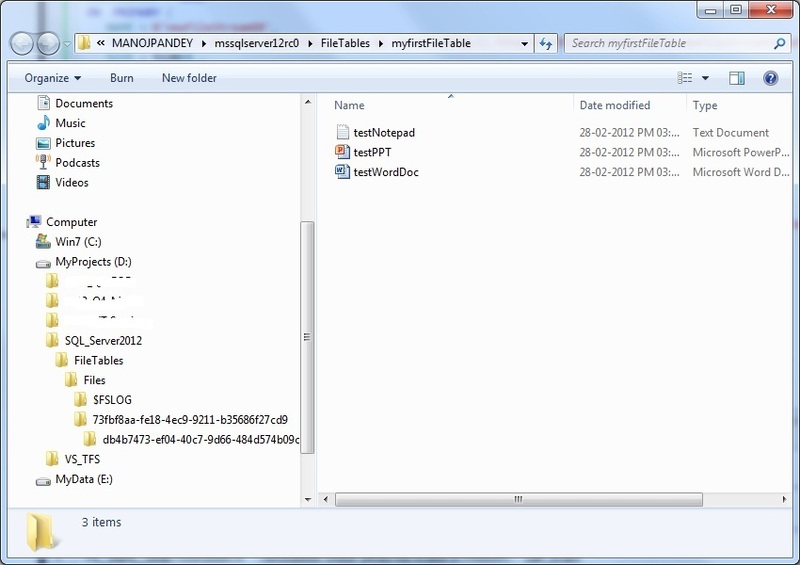 In my [next post] you can check how you to use Full Text Search with files stored in FileTables. @Sleva, thanks for your comments. The NON_TRANSACTED_ACCESS option allows you to show/hide the option to Explore File Location from SSMS by right clicking on the FileTable. Sorry, for responding so late, I just check your comment today only! Can you please elaborate what is NON_TRANSACTED_ACCESS=Full option.